It seems like we just can’t stop talking about keywords and we’re sure you won’t see the topic leave your news feed anytime soon. By now, you probably know that keywords are much more than just words. Keywords are essential to bringing traffic to your website and marketing your advisor firm. They are one of the easiest and cheapest (aka free) ways to upgrade your SEO efforts and bring in new leads. Trust us, if you haven’t already utilized them, its time. 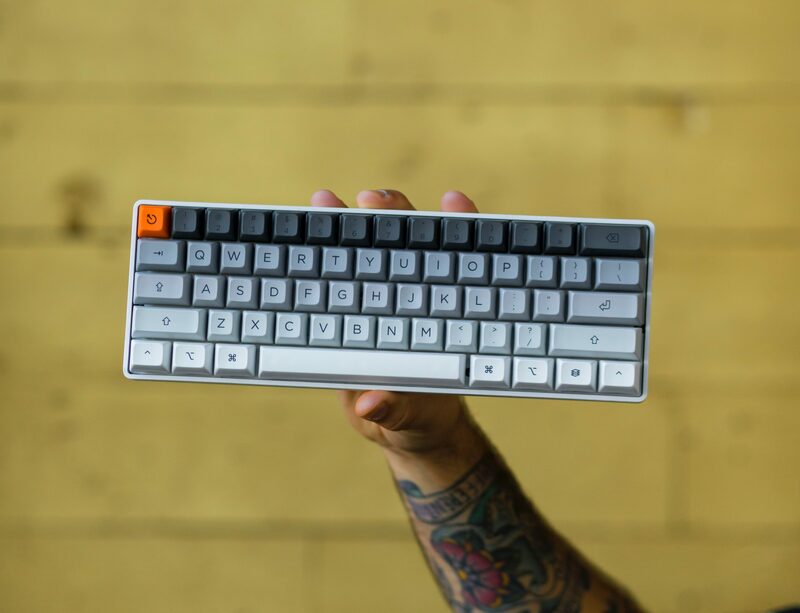 What are keywords? 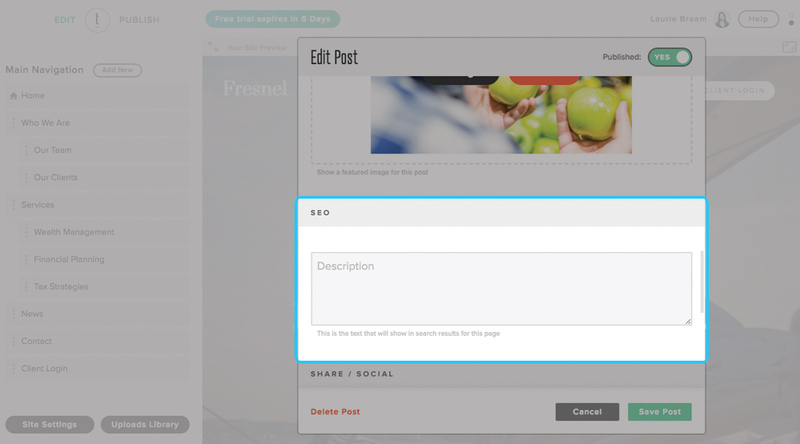 They are words throughout your website that define what your content is about. They can be in your bio, on your homepage, or in blog posts. They can be placed almost anywhere on your website and be considered a keyword. Twenty Over Ten client, Fairhaven Financial Advisory’s homepage includes keywords like “financial planning” and “retirement,” perfectly describing their business. Ultimately, they communicate to top search engines like Google what information is on your website. When a phrase is entered into the search box, search engines want to pull the most relevant and useful websites to populate the search engine results page (SERP). To do so, they rely on the keywords you use in their algorithm to determine if your website fits the criteria. You can use this to your advantage! All you have to do is put yourself in the shoes of your prospects. What would they search for? Whatever it may be, you will want to include those words and phrases into your website. This will help your SEO ranking and increase your chances of making it on the first page of SERPs. Being on the first page is the first and most important step in turning prospects into clients. I mean, how could they turn into clients without knowing your firm exists? This drives organic traffic to your website and connects you with prospective clients that are looking for what your offer. Twenty Over Ten client, Mountain Pass Planning, does a great job of including the right keywords on their website, allowing them to show on the first page search results when we search “hopewell junction financial planning” on Google. These keywords are short, simple, but not at all sweet. They are often one word and account for the highest search volumes. 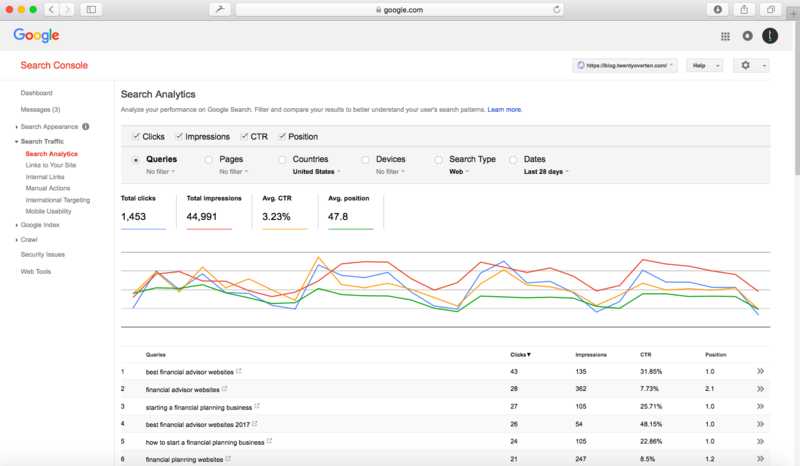 Sometimes this tricks people into thinking they are the best keywords to rank for, but beware! It’s tempting, we know, but these types of keywords come with the most competition. Just like their name, they are broad, non-specific, wide reaching, and all embracing. Because they are infuriatingly vague, the word may not only apply to your business, but to other companies, industries, and websites that you can’t outrank. You may offer tax planning and hope to rank high for the word “taxes,” but it would be almost impossible to beat websites like TurboTax, the IRS, Wikipedia, and USA today. While you should definitely still include “taxes” and similar keywords throughout your website, you might not necessarily rank solely on these words. Your ranking will come from the combination of these broad keywords with other types. Fat head keywords are basically just two or three broad keywords, making them a tad more specific than broad keywords. They are very similar to broad keywords in that a whopping 18.5% of all searches use fat head keywords. Although they may have a meager decrease in competition compared to broad keywords, your odds of outranking big business websites are still slim. Fat head keywords would be keyword phrases like “tax planning.” Again, you’ll want to still include these words in your website, but they won’t be the sole reason you make it to the first page of SERPs. Twenty Over Ten client, Financial Planning Done Right, does a great job of adding fat head keywords and other types of keywords to land in search results for prospects. Now we’re getting somewhere. These keywords are even longer phrases that make a search more precise. The average prospect looking for financial planning and services will pop this type of phrase into the search bar. So, you may not be ranking for everyone everywhere, but you will be reaching your niche target market. Isn’t that better anyways? Because these keywords are more specific, you’ll no longer be competing with the rest of the universe to make it onto the first page results. Now you’ll just have to create an SEO friendly website that can outrank others in your industry and local area. This is where you want to be! This would mean you’re adding a combination of keywords into your website to meet what a prospect would enter into their search query. So if they are going to type in “tax planning and holistic financial planning in Chandler, Arizona” you won’t have to add that sentence per say, but keep those keywords in mind when editing your website. Of course add “tax planning” and “holistic financial planning” to the list of your services and maybe sprinkle “Chandler, Arizona” throughout your home page, bio, and contact page. These are the types of keywords that bring organic traffic to your website. 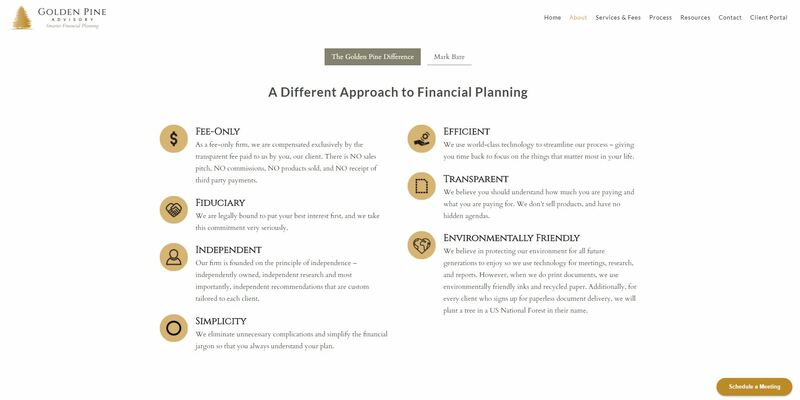 Twenty Over Ten client, Golden Pine Advisory, has done a great job of including chunky middle keywords like “fiduciary,” “independent,” and “financial planning” that prospects are sure to look for. When a searcher types long-tail keywords into the search bar, you are no longer competing with thousands upon thousands of websites to be in the top results. This is because the search is so specific that it is essentially identifying you and your business. Don’t get me wrong, if you have bad SEO, you may still not show up in results, but if you have the basics down, you’re good to go. Long-tail keywords would include a search like “ABC Firm tax planning and financial planning in Chandler, Arizona.” This likely means that the person searching is specifically looking for your business. They can’t make it any easier for you to show up in their search results so be sure to include these types of words and phrases in your website. 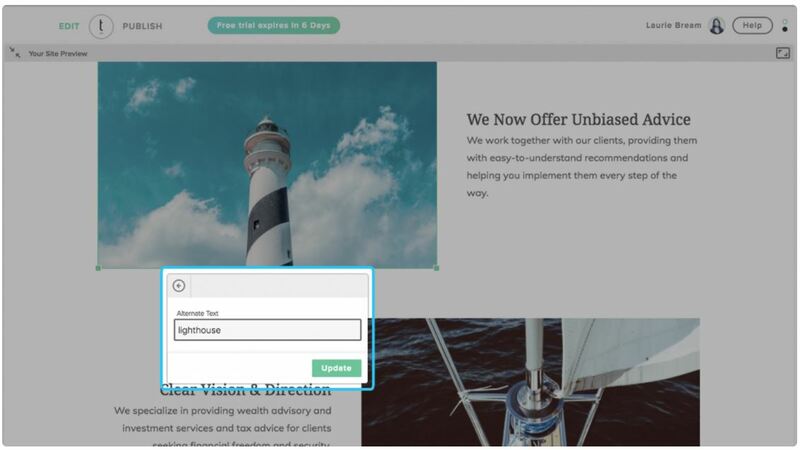 Twenty Over Ten client, Forward Thinking Wealth Management, uses long-tail keywords throughout the header tags of their website to show up higher in search results for those searching for fee-only financial services for physicians and retirees. Now, the million dollar question. How do you know what keywords work for you? Think about your business at its core and what few words it would boil down to. Think about what your prospects are searching for. There are also tools you can use to find the best keywords that work for you. Google Trends finds top keywords and topics being actively searched now. Google Search Console is more specific to your website and shows keyword queries that are currently being used and clicked on by your visitors. Although it may be easier to rank for some types of keywords over others, you’ll want to use a combination of them all for the best chances of showing up in the first page of search results. Don’t forget to include more specific keywords like your location and name, that will drive your SEO ranking. How can you properly incorporate these keywords and phrases into your website? This is the easiest part! Whether you’re creating a website on your own or just simply optimizing your existing site for search engines, it’s pretty simple. Our team is here to help you make sense of it all! Our SEO Kickstarter Package delivers maximum impact by completing the most important SEO tasks in regards to how your website is setup and registered with Google.